Well, well. One of the generation’s most fearsome fast bowlers, renowned for his silence has spoken after almost fifteen years since his retirement. 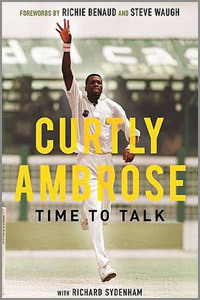 The man dogged by the phrase “ Curtly speaks to no man “ – a saying he refutes in a chapter devoted to it – has very aptly entitled his book Time to Talk. The lucky man he spoke to was Richard Sydenham, a writer for amongst other papers, the Sunday Telegraph and Sunday Express and the book is fascinating possibly because few of us know much of the off-the-field Ambrose. He comes across as a forthright yet fair, humble, proud and honest man. It is easy to forget that he made his international debut at the end of the 1980s when the West Indies side was still formidable and kept them afloat – at least as a bowling force – until his retirement in 2000. Curtly – now Sir Curtly: a well-deserved honour following the impressive line of West Indian cricketing knights - has an interesting story to tell. It seems strange reading the book to find that he took up cricket at a comparatively late age as basketball was his main love. He took to both sports but spectators, if not batsmen, will presumably be pleased that he did take up cricket although basketball has remained a favourite of his. It makes his cricketing career figures even more remarkable. Music also plays a prominent part in Curtly's life and, since his retirement, he has been a part of bands and also has his own group. In both of his interests, his passion comes out when he talks of his contribution to team meetings: he was not afraid of making unpopular comments but, once said, he would move on and grudges were not held. He expresses dissatisfaction in various areas with his time at Northants and his somewhat infamous spat with Steve Waugh is mentioned but, as always, events come across fairly. Mind you, Waugh is admired as one of his top cricketers in one of the latter chapters and it is Waugh who contributed one of the forewords. The Allen Stanford imbroglio is also mentioned. What promised much for West Indian cricket quickly became overshadowed when the financier was jailed. Curtly also comes across a confident man and perhaps this is evidenced in the way he describes himself in the third person on occasion. Time to Talk is a good and nice read and we should be grateful to find out a good deal more about this fine fast bowler who continues to be involved with West Indian cricket.